I am always happy to see a new album from Rip Cat Records, the purveyors of fine blues, swing, and rockabilly who are based in my hometown of Long Beach, California. 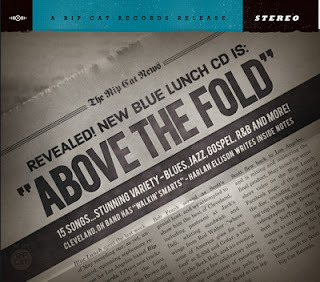 They only represent solid artists and put out great music, and it is no surprise that their latest release from Blue Lunch, Above the Fold, is no exception! Now, these guys are not from the Southland but come straight out of Cleveland, a truly rocking city. This band has been kicking around in various forms since I was in college (30 years ago) and Above the Fold is their eighth release. The gang includes Peter London on vocals and harmonica (the only original member), Bob Frank on vocals and guitars, Mike Sands on piano, Ray Deforest on bass, and Scott Flowers on drums. Completing the octet is also a killer horn section of Chris Burge on sax, Mike Rubin on trumpet, and Bob Michael on trombone. This album is chock full of originals written by Burge, Frank, and London, along with a couple of other tunes that may be familiar to you, making for an hour-long set. Though they are often referred to as a jump blues band, these fifteen songs draw from many genres so the show never gets into a rut. And it really is a show, as most of the material was laid down live in the studio (with the usual vocal overdubs), which results in a vibrant sound throughout. Above the Fold kicks off with “Ain’t Trying to Kill Nobody,” and it is apparent that this will be a fun album! The clever lyrics, slick guitars, and smoking sax ensure that the listener is drawn in right away. From there they continue their tour through different styles, with a bit of jazz in “One Fine Day,” a righteous boogie with “The Long Game,” and some Rip Cat swing on “Everybody’s on the Phone.” They also touch on blues, Afro-Cuban rhythms, pop, gospel, rhythm and blues, big band, and jump blues. There is a little something for everybody here, and they even threw in a few instrumentals! The standout track of this effort is “Where Do You Think It’s Going,” which checks all of the boxes. It has a glorious gospel/soul/rock feel with strong lyrics, perfectly arranged horns, a smoking harp solo, a roaring bass line, and killer guest vocals from Evelyn Wright and Hammond organ from Tim Longfellow. This song comes in under three minutes, and I wish it were a bit longer! There are also a couple of lost hits of the 1950s included on the album: Andre Williams’ “Tossin’ & Turnin’ & Burnin’ All Up Inside” and Dave Bartholomew’s “Love No More,” both of which play to the strengths of the horn section. And finally, the set draws to a close with a traditional a capella gospel tune, "Good News," which was the perfect way to finish this project. Above the Fold is a really cool album full of songs that are all a little different, and the guys from Blue Lunch really delivered the goods. Don’t try to put them in a box, just buy the CD and enjoy their music, or better yet check out one of the 120 shows they perform every year. Trust me!